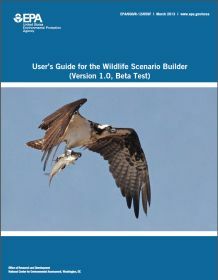 EPA is announcing the release of the Wildlife Scenario Builder (Version 1.0, beta test) and new User's Guide. The Wildlife Scenario Builder (WSB) was developed to improve the quality of wildlife risk assessments. It is a Windows application that helps risk assessors estimate air, water, and dietary intake rates for a variety of North American Wildlife species. The WSB is designed to make wildlife exposure estimates more consistent, transparent and efficient. The wildlife and life history databases supplied with the WSB contain information on 49 North American species of wildlife, including 24 species of birds, 17 species of mammals, 3 species of amphibians, and 5 species of reptiles. The life history database contains natural history information (e.g., distribution, habitat, diet) and physiological data (body weight, intake requirements for air, water and food/energy) that are most relevant to wildlife exposure assessment. It makes calculating exposure via the diet easier and more accurate by calculating energy requirements using allometric equations; calculating the energy content of food items; linking food energy content with measured dietary item intakes; and allowing for user adjustment of diet scenarios. It facilitates review by indicating values that have been adjusted by the user; providing references; and generating standard reports outlining assumptions and calculations. U.S. EPA. Wildlife Scenario Builder and User's Guide (Version 1.0, Beta Test). U.S. Environmental Protection Agency, Washington, DC, EPA/600/R-12/059, 2013. For additional comments please contact the wsb at wsb@epa.gov.